Checkout allows your store to show real-time shipping options to your customers during the checkout process. With Rates at Checkout, you will be able to show real-time shipping options to your customers during the checkout process in your store. To do this, make sure Rates at Checkout are enabled on both Easyship and in your Store Settings. Once Checkout is enabled and added to your store, users will be presented three rates by default. These rates are the cheapest, fastest, and best value options at checkout. If you wish to change the shown couriers, please see our article on shipping rules. Also make sure that you upload all your products to the Easyship Products feature to make sure that correct rates are displayed during checkout! Please note: To enable Easyship Checkout with Shopify, you need to have 3rd party calculated rates enabled on your account. 3rd Party Calculated rates are included in all annual plans and Shopify Advanced. Or it can be added to any plan manually as an additional add-on by Shopify support if you contact them directly. Once enabled, you will be able to edit your settings by clicking the Settings button. 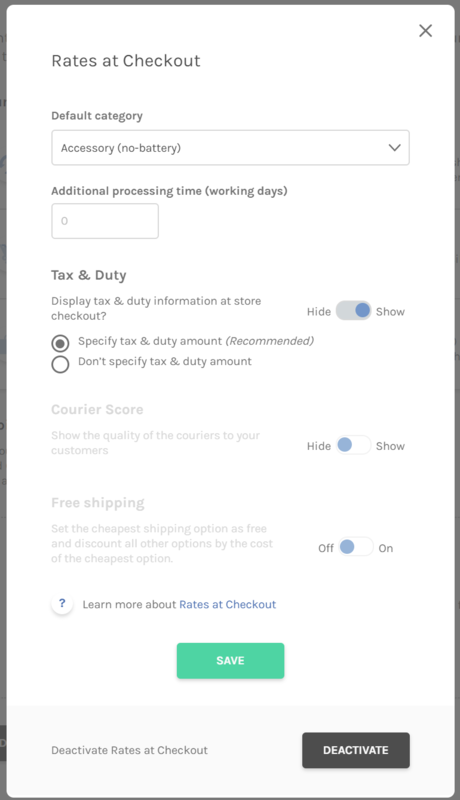 When you click the Settings button, you can choose several different settings such as displaying Tax & Duty, Courier Score and Free Shipping. To do this, make sure Rates at Checkout are enabled on both Easyship and your store. Please note that any settings you have set up on Easyship will override settings you have on your store. Therefore, it's best that you only have Rates at Checkout set up on one platform, not several. When you click the Settings button, you will be able to choose whether you want to display tax & duty information at your store checkout. You can also set up free shipping. As international shipping can be costly, a best practice is to set a limit when offering free/discounted shipping. This will help you avoid paying unexpectedly high shipping costs while at the same time, still rewarding customers who spend over a certain amount at your store by offering them discounted shipping rates. 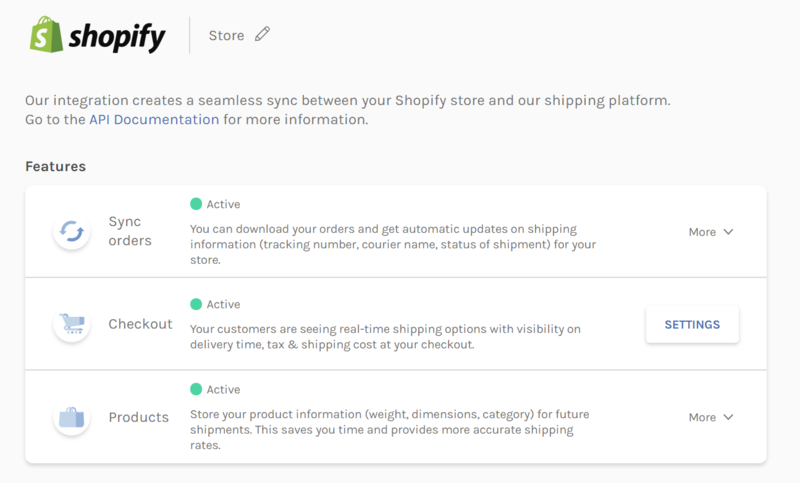 You can enable free shipping on Easyship under your store settings in checkout settings under "Connect" in your dashboard. In the settings you can choose a name for your settings, which will be displayed on the main page if you have several different free shipping options. You can choose which countries this setting should apply to. By default the feature will have selected all countries. But you can also limit this to specific countries. Minimum Order Price will decide on the basket value for free shipping to apply. Please note that this does not take into consideration any voucher-codes used. Maximum Shipping Discount will set a limit on how much you wish to discount the least expensive option with. Meaning if you have certain destinations or orders which cause the cost of shipping to be high you can have a threshold to limit the discount. Some solutions that we work with charge a separate fee for pickup. You have the option to pass this fee on to your customer. Currently this is only Applicable for US accounts. The default setting for this feature is to pass all pickup fees to your customer. 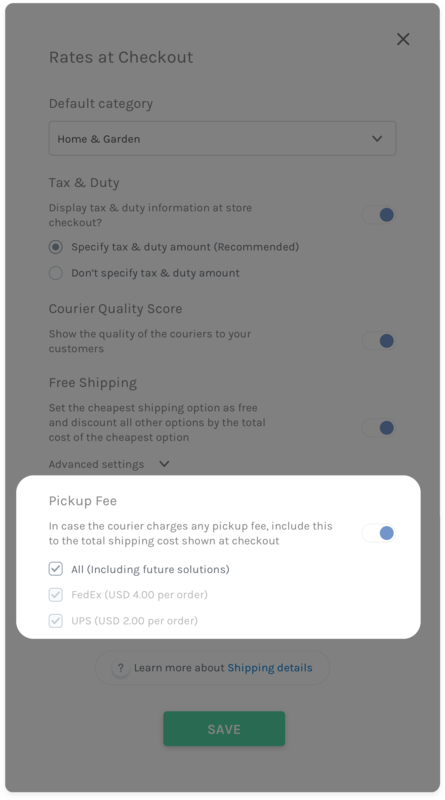 It's also useful to note that if you keep this setting, it will apply to all future solutions with pickup fees that are added to the Easyship platform. If you don't like the default setting, you can simply choose the couriers that you would like to do this for, or turn off the setting and cover these fees for the customer. To access this feature, go to Connect < Your Store's Name < Features < Settings button. I cannot active the checkout on my webstore, why? The first time that i install ok, but now is second time and the app not work well... ineed help, this is app was the one that most answered my needs. I had a look at your account and from what I can gather, you seem to currently be on a Shopify Plan which does not allow 3rd Party Calculated rates. To enable Easyship Checkout with Shopify, you need to have 3rd Party Calculated Rates enabled on your Shopify account. 3rd Party Calculated rates are included in all annual paid Shopify plans and monthly paid Shopify Advanced plans. It can also be added to any plan as an additional add-on by Shopify support if you contact them directly. If you confirm with Shopify that you in fact should have access to 3rd Party Calculated rates on your current plan. Please let us know and we will have a look with our developers if there is anything strange happening in the magic link between Shopify and Easyship! I hope that this solves your question and that you can start offering Easyship Checkout to your clients soon! How to add default box dimension and weight at check out because without that the shipping rate show on check out are always lower than actual. You are correct, the rates shown will be based on the available information. For instance, Shopify only provides the weight, not the dimensions for your products. To resolve this, Easyship has a built in products feature which allows you to save all necessary information for all your SKUs so that the rates are correctly displayed. If you have not uploaded your products, everytime a new product syncs to Easyship and you enters its dimensions, it will automatically get saved to the Products feature. This makes sure that the entered dimensions are used the next time for the imported SKU!